Optimizing For Google, Bing and Yahoo!!! 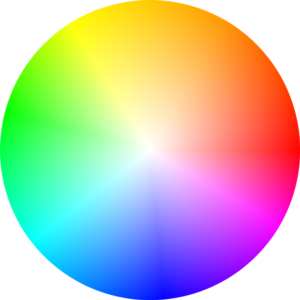 In case you didn’t know… this is a colour wheel. Last night after work, I was playing around with my tablet and went searching for information on how to setup a colour wheel, and found a great example of what I would coin “modern seo”. Instead, what popped up was a perfect example of the low-hanging fruit we all dream of when it comes to ranking in search engines. Confession time… I enjoy drawing and painting in my free time, so I spend a lot of time watching artists doing their thing on YouTube. Why Reddit? Like most people in the digital age, I turn to social media when I have questions about the technology I own. Specifically, I wanted to hear from people using the product and learn the tips & tricks they’ve picked up in the trenches. Here is where I made a mistake in my search, which led to me seeing the trick. Typically, The top result was clearly the result of a slick little search engine optimization campaign, where the intended audience was on Reddit. 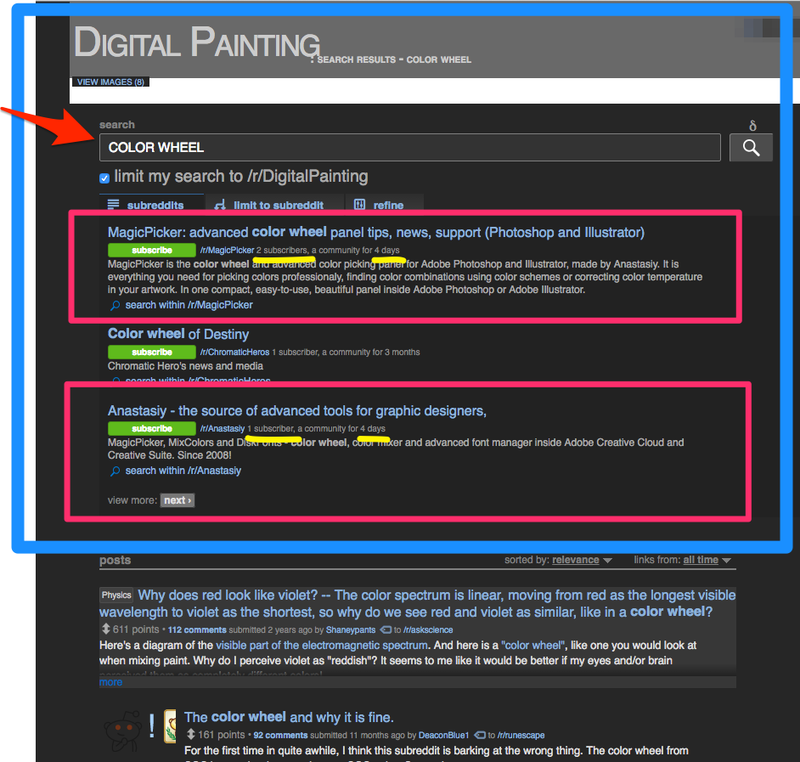 What you’re looking at here is a color wheel product/software named MagicPicker, who have created (not one, but) two subreddits (which is Reddit’s version of a sub-forum) named after their product and company respectively, with a focus on the search term “color wheel”. But that wasn’t the most interesting part. What I couldn’t get over are the little pieces I’ve underlined in yellow, which show that the amount of time these subreddits have been around to gain traction is less than one week. In total, both subreddits put together have only 3 subscribers. Not only that, but – like many search engines… hint hint – you’ll notice that subreddits show up above posts, so not only is this an easy tactic to employ, which takes less than a week rank and show results, but it gets automatically shimmed to the top of the pile. Pro Tip: Something to think about here is the balance of effort versus reward. There are a lot of search engines you can dominate in a days work like this… So the missing piece is knowing which search engines make sense for you and your business. So what’s going on, here? To identify your potential customer’s search behavior, you need to understand their needs, and to do that, you need to get deep into their head. Remember when I said, “I wanted to hear from people using the product and learn the tips & tricks they’ve picked up in the trenches”? MagicPicker does. MagicPicker knew that’s what I’d be thinking long before I was ever thinking it. How would you like to be able to tell the future like that? Some weeks later, I stumbled across a small home-cleaning business owner talking about his latest revelations in modern search engine optimization. What can Google Home search results tell us about the future of search engine optimization? When seeing people swoon over new technology like this, you can glean information to identify the future of your marketing efforts. Over time you’ll spot these opportunities again and again; the two examples I’ve outlined here are not outliers, they are the norm. Think about all the places people are asking questions online: Facebook Groups, LinkedIn Groups, Ask.com, Yahoo! Answers, Forums, Slack groups, Social media, Quora, Moz, etc. There are so many places you can be out and in the faces of potential customers asking questions. So what does this mean for the future of search marketing? SEO Is Dead… Long Live Modern SEO! Does this mean SEO is dead? No, but sometimes yes. SEO is dead in the sense of what the uninformed customer is looking for. Having heard stories of pinning themselves to the #1 spot in Google by pointing a handful of potent private blog network links at their homepage, potential clients often approach search marketing agencies – like ours! – with unrealistic expectations. The days of throwing $700 per year at your site and being on top of Google are long gone. If that’s the budget you’re ready to invest, that money would be better spent elsewhere in your business. In fact… In 2018, the days of throwing $700 per month at one of the cheaper “search marketing agency” are long gone. When I saw Ryan Stewart telling us he stopped selling SEO, and we should too, I was right on board. Sign me up! Unbeknownst to me, Ryan had been struggling with the same repetitive conversations we are over here at Client Coffee, and was responding to his potential clients in a very similar manner. The game has changed, and there are many, many angles to business of topping search engines. Because you’re not the only plumber in Toronto who wants to rank #1 in Google for the term “plumber in Toronto” and there are big fish – paying big money! – to protect their spot, and the future of it. They’re willing to pay hand over fist for that spot, because it provides him with business for the foreseeable future. Search Engine Optimization in today’s world means a deep understanding of who your customer is and where they hang out, then engaging in the social networks and online communities they’re hanging out at, and get them answers to their questions, free of charge, no sales pitch. Only once you’ve got a real social media presence (one that feels like a human, not a business) not fabricating posts, but documenting your day-to-day (in-office, and in-industry! ), a real blog talking about what you’re up to, what you know to be true, and answering real questions that your potential prospects are asking you… only then can you expect to dominate Google for that word you had in mind. Then getting to #1 in Google will very likely stay a pipe dream. What about you? Where do you see search marketing going in the next few years?